The most intimate and elaborately enhanced addition to the Hemingway Library series: Hemingway’s memoir of his safari across the Serengeti—presented with archival material from the Hemingway Collection at the John F. Kennedy Library and with the never-before-published safari journal of Hemingway’s second wife, Pauline Pfeiffer. 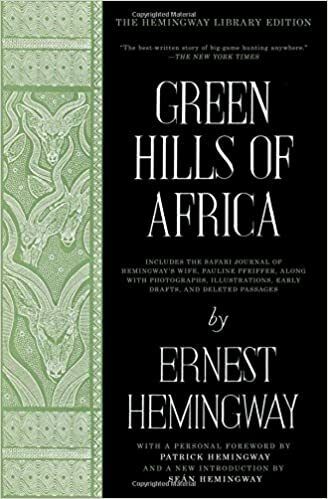 When it was first published in 1935, The New York Times called Green Hills of Africa, “The best-written story of big-game hunting anywhere,” Hemingway’s evocative account of his safari through East Africa with his wife, Pauline Pfeiffer, captures his fascination with big-game hunting. In examining the grace of the chase and the ferocity of the kill, Hemingway looks inward, seeking to explain the lure of the hunt and the primal undercurrent that comes alive on the plains of Africa. Green Hills of Africa is also an impassioned portrait of the glory of the African landscape and the beauty of a wilderness that was, even then, being threatened by the incursions of man. This new Hemingway Library Edition offers a fresh perspective on Hemingway’s classic travelogue, with a personal foreword by Patrick Hemingway, the author’s sole surviving son, who spent many years as a professional hunter in East Africa; a new introduction by Seán Hemingway, grandson of the author; and, published for the first time in its entirety, the African journal of Hemingway’s wife, Pauline, which offers an intimate glimpse into thoughts and experiences that shaped her husband’s craft.